Times of the Islands – Lost at Sea! Rocky Higgs recalls his ocean ordeal. North Caican Rocky Higgs is happy to be alive after his ordeal in 1984. “It makes one to realize how fragile man is,” says Rocky Higgs of his experience of being lost at sea 34 years ago. Low-lying islands such as the Turks & Caicos have always been fragile places, and the people who live so close to the sea grow up aware of their smallness compared to the ocean. Sometimes, though, events bring the message home hard. What happened to Rocky in 1984 was one of those events. Rocky Higgs, a North Caicos man, grandson of Paul Robert Eliston Higgs, was 24 years old the day he left from Five Cays, Providenciales, with his 16 year-old brother Nat, to dive for conch. They were headed for Sand Spit beyond French Cay in a blue 14-foot boat when their engine blew out. They dropped anchor to deal with the situation when another problem arose: A storm that dragged them onto a shoal and cut the anchor line. The boat was adrift. The search for the two Higgs boys began quickly, and Rocky recalls seeing planes above, recognizing the Coast Guard and Clifford Gardiner’s Aztec. But the searchers were unable to spot the drifters. “The boat was blue and the ocean was blue.” The drifting pair also saw ships passing by out to sea, but couldn’t get anyone’s attention. Finally, they drifted near a shore, which Rocky realized when they saw first a huge rock “like a turtle” and then plenty of sea grass, which told him land was near. “My mind was telling me to get on shore,” he says, so they jumped out of the boat and swam. They were separated in the water, and Rocky lost his (now very loose) clothing. He searched for several hours and finally found his brother, too weak to walk. “I put him on a piece of plywood and left him to get help.” Rocky believed he might be on Cuba, but they were actually on Great Inagua. Weak and hungry, Rocky lost all orientation. “I walk, I walk, I walk. I never know where I was going.” One day he wandered into what looked like a fish camp, where he found four pounds of sugar, matches and about 10 to 20 pounds of marijuana. “I tried to get high. I made a big fire and I smoked that weed to comfort myself.” He continued to wander, looking for both help and for Nat. “I prayed to die,” he admits. About eight days later, he saw a one-engine plane circling. Addled from all his experiences and unsure of where he was, he tried to run. But he’d been found by Joe Smith and Terry Brown of Lighthouse Mission Church. “They put clothes on me and they prayed, and then they took me to Matthew Town in Great Inagua. I kept asking for my brother Nat, saying I couldn’t find him. They tell me Nat was okay, in the hospital.” He’d been found first. “Oh, they treat us good there,” Rocky recalls of the people on Great Inagua. He and Nat were nursed to health and fed well by the local residents before they were taken back to North Caicos, where they arrived 14 days after having left Five Cays. Afterwards, Rocky’s grandfather encouraged him to go back out on a boat, telling him that if he didn’t, he would be a coward. 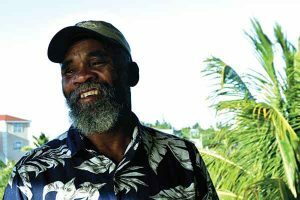 Rocky spent many more years getting conch and lobster, as well as doing some roaming and other work, including migrant farm work in the United States. He has 11 children and sees his survival as a part of God’s providence. “I have to survive until I hear the Master call,” he says. Years later, he would be out diving when his brother Conrad, left above to mind the boat, died of a heart attack. “I don’t think the sea likes me very much,” he says, with only a touch of irony. He also acknowledges that the bargains made with God in hard circumstances dissipate easily—his at-sea promise to no longer drink went by the wayside when the thirsty man was given beer. Yet there is still amazing grace. We’re not perfect, and we may never be completely “saved.” But we survive and keep trying. Freelance writer Jody Rathgeb and photographer Tom Rathgeb have been visiting the Turks & Caicos Islands since 1990 and have had a home on North Caicos since 2001. They divide their time between North Caicos and Richmond, Virginia. Jody has been writing for Times of the Islands since 1992!